Learn how to access and use Bloomberg at NYU Libraries. Bloomberg is a terminal-bound financial services platform that provides analysis and quotes for equities and indices, current company and economic data for the countries of the world, real-time and historical industry and market news, and advanced analytical and data functions. Bloomberg is an industry standard in financial services and investment banking. The Library's academic subscription does not include the trading module, and market data is delayed by 15 minutes. Bobst Library, 5th Floor: Two terminals are available in the south wing. No appointment is necessary. NYU Shanghai Library, 4th Floor: There is one terminal. To reserve a time, please book an appointment. NYU alumni and Friends of Bobst Library are not eligible for Bloomberg access. See "Alumni Access" (below) for an alternative. Access is limited to currently enrolled/employed members of New York University. No exceptions. There is no downloading on the Bloomberg terminal, only print screen. Please limit your searching time to 25 minutes when others are waiting. 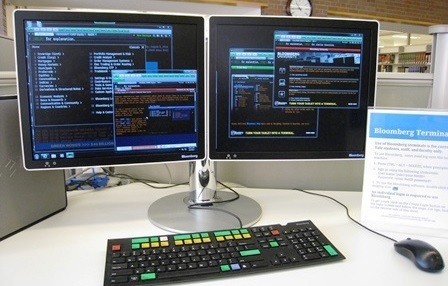 Unattended items at the Bloomberg terminal will be removed immediately. Stern School of Business: Shimkin Hall, 2nd Floor: Four terminals are located in Robert B. Menschel/Horace W. Goldsmith Foundation Room (Shimkin 2-101), which is inside the Nyman Family Reading Room (Shimkin 2-100). AVAILABLE ONLY TO STERN MBAs. Tandon School of Engineering: Rogers Hall, 2nd Floor: Room 208. AVAILABLE ONLY TO TANDON STUDENTS. School of Professional Studies (SPS): Contact your instructor, advisor, or department chair for details. AVAILABLE ONLY TO SELECT SPS MAJORS. Access policies are set by Schools. Members of those schools may require additional permissions for access. Access to all NYU Bloomberg terminals is restricted to currently enrolled/employed members of New York University. NYU alumni who are eligible for a New York Public Library (NYPL) membership and are a NYPL card holder may visit the Science, Industry and Business Library (SIBL) branch at 34th St and Madison Ave to access Bloomberg. More details can be found at their Bloomberg subscription description page. Bloomberg must be used at the terminal; there is no remote access. You can recognize the terminal by its distinctive hardware: two monitors and a color-coded keyboard. The login credentials required to use the Bobst Library terminals are posted at the terminals: The username and password are located on the desk, next to the monitors. Login directions for other terminals vary. Advanced users who want to save their progress and customize the interface can register for an account.